All parents know that kids can be picky eaters and when it comes to packing lunch for school every day, finding something new to send can be tough. As parents, we want to provide healthy school lunches that our kids want and will look forward to. If you find that your kids are getting bored with what you are sending, check out the five healthy lunch ideas below. Your kids are sure to want to eat their lunch when you try these options! One fun option is to pack a taco bar of sorts for your kids. Use whole wheat tortillas, shredded cheese, a little guacamole, and crumbled beef to let your kids make tacos at school. This option is better for older kids but a great way to create a customized lunch. If your kids like to play pretend and enjoy using chopsticks, try creating play sushi. Simply use bread or tortillas and wrap your child’s favorite cheese and sandwich meat into pinwheels. Cut into small sizes and pack chopsticks to make lunchtime fun. Add in extra food items that can be picked up with chopsticks such as cucumber or other chopped veggies. One of the newer ways to eat Italian ravioli is to toast it. Ravioli can be breaded and then lighted toasted in the oven for a great meal. Your kids will love taking leftover toasted ravioli to school. Be sure to add in a small cup of pizza or spaghetti sauce for dipping! What is more fun than having breakfast for lunch? Send heart-shaped waffles, fruit, and sliced precooked bacon or other favorite breakfast items for school lunch. Your child will love having an unusual meal during lunchtime. Breakfast consists of several items, so you easily switch up what you pack the kiddos for school lunch. Make lunchtime fun by making unique kabobs for your kiddos. Use non-pointy sticks and cut out fun shapes for bread and cheese, layering each item on the stick along with cherry tomatoes, sandwich meat, and other veggies. Take what your child likes and add it to these fun kabobs for an enjoyable lunch. 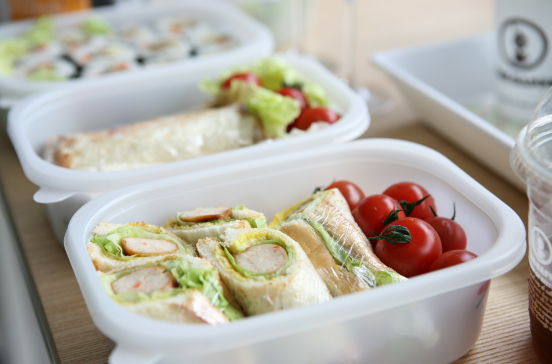 How have you kept school lunches interesting throughout the school year? Share your ideas! To learn more about our urgent care centers, call 888-MDNow-911 or visit www.MDNow.com.